Once upon a time, I visited my German friend. We drank coffee, walked around her city, and cooked. It was awesome (minus a little back injury thanks to some icy stone steps). 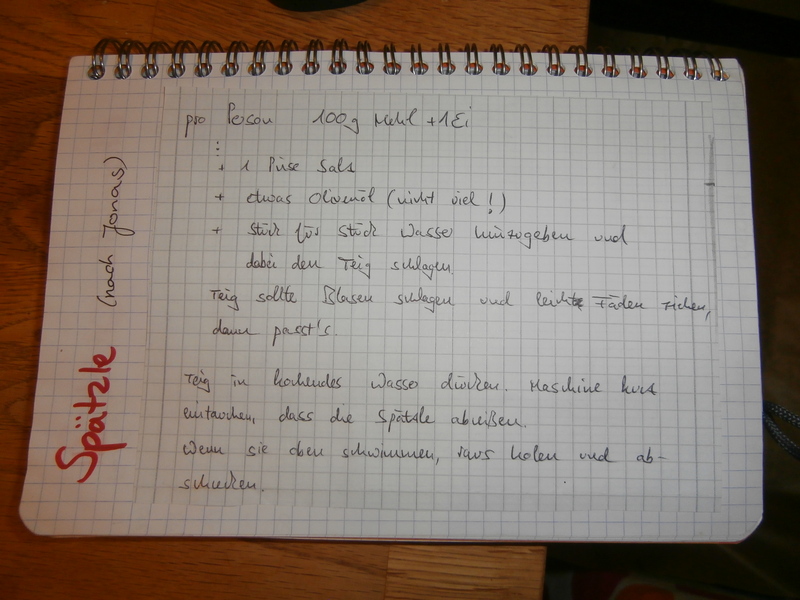 And I have finally gotten around to reliving one of the recipes we cooked: Spaetzle. And it’s a perfect recipe to share on Meatless Monday. Literally translated, spaetzle means “little sparrow” and denotes a soft egg noodle or dumpling from the Germanic region of Europe. My friend taught me how to make this dish in her home, shared the recipe with me, and I recreated it in my home. 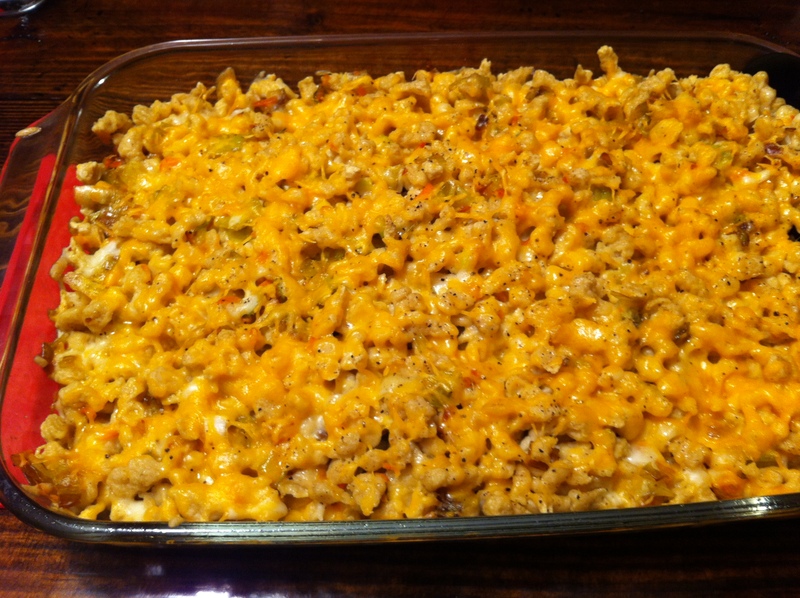 Since I’m such a great sister, I even invited my sister and her kids over to share in the cheesy deliciousness that is this dish. The 5 and 7 year old are still struggling with their German pronunciation, so they called this dish spatula, hence the post’s title. It was adorable. 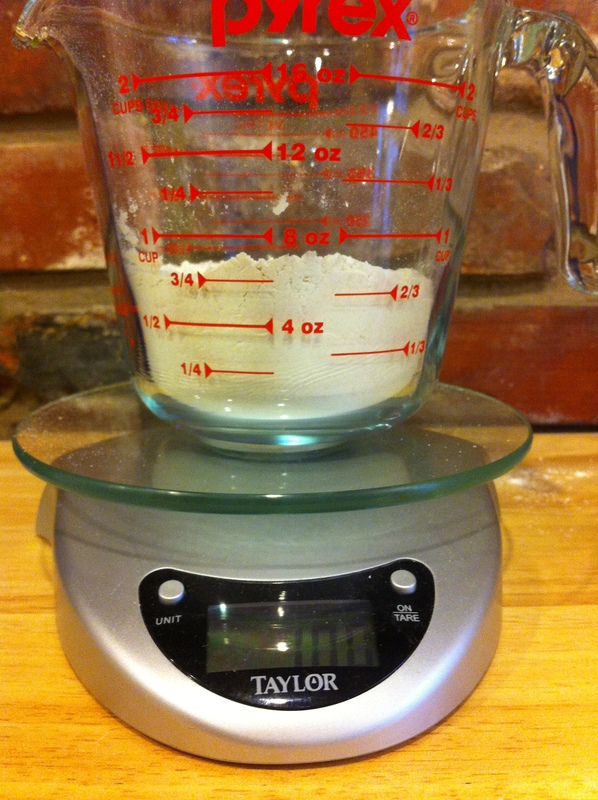 And don’t worry my fellow Americans, I translated the recipe into English and measured the ingredients into cups instead of grams. 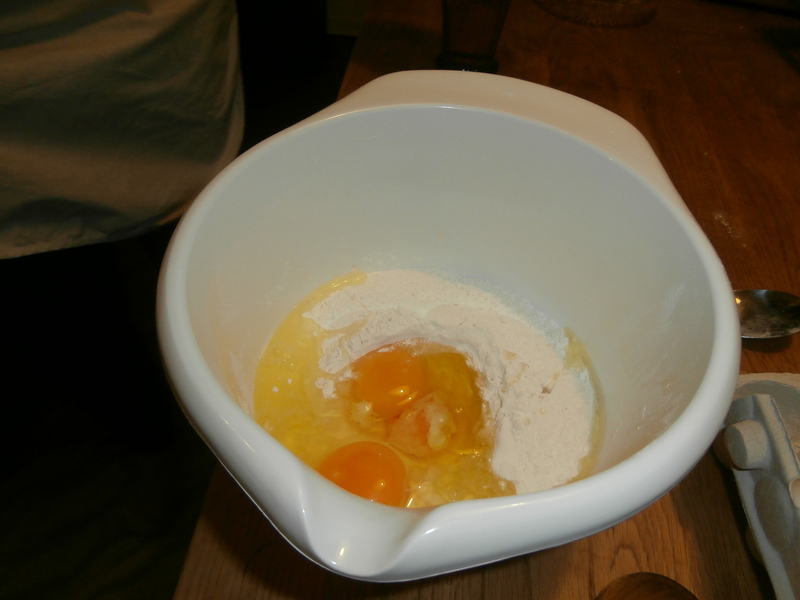 The recipe starts by mixing 100 grams of flour, 1 egg, a pinch of salt, and a little bit of oil per person you are cooking for. 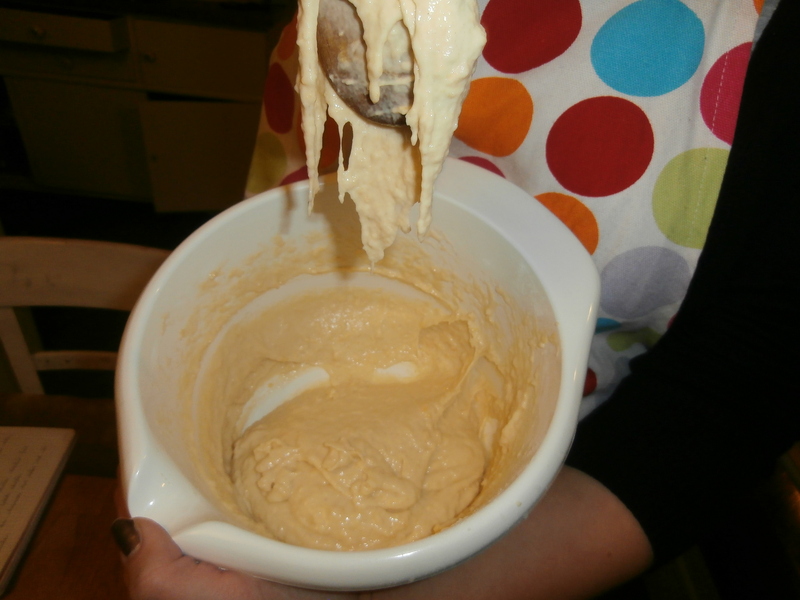 Water is slowly added until the dough is sticky and drips off the spoon when you lift it up. This is the tricky part. You want the consistency to be just right so that you can push it through a spaetzle maker so it will form noodle-like drops that will drop into the boiling water below. When they float to the top, they are done and you can fish them out with a slotted spoon. Then, as the German says, you want to “scare” the spaetzle with ice water to stop the cooking process. 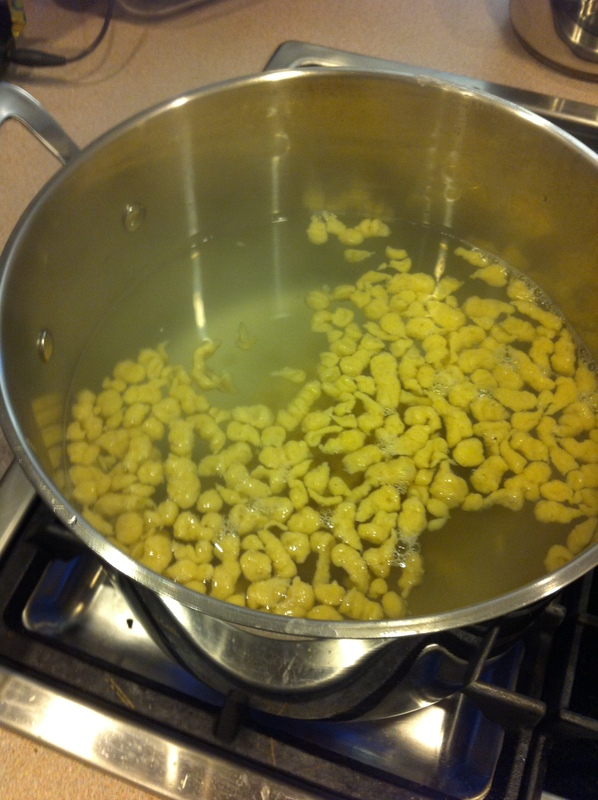 Then we turn these lovelies into Kasespaetzle…cheese spaetzle. I personalized the recipe by adding some herbs–sage and rosemary–and adding leeks instead of regular onions, which would work perfectly fine if you prefer them. 1. Preheat the oven to 350 degrees. Start a large pot of salted water on the stove to bring it to a boil. Once it comes to a boil, reduce the heat to keep it at a simmer. 2. In a skillet, heat butter and 1 tbsp olive oil over medium low heat. Remove the root end (about half an inch) and the dark green park of the leek. Cut the remaining stalk in half lengthwise. Rinse thoroughly to remove any sand and grit. 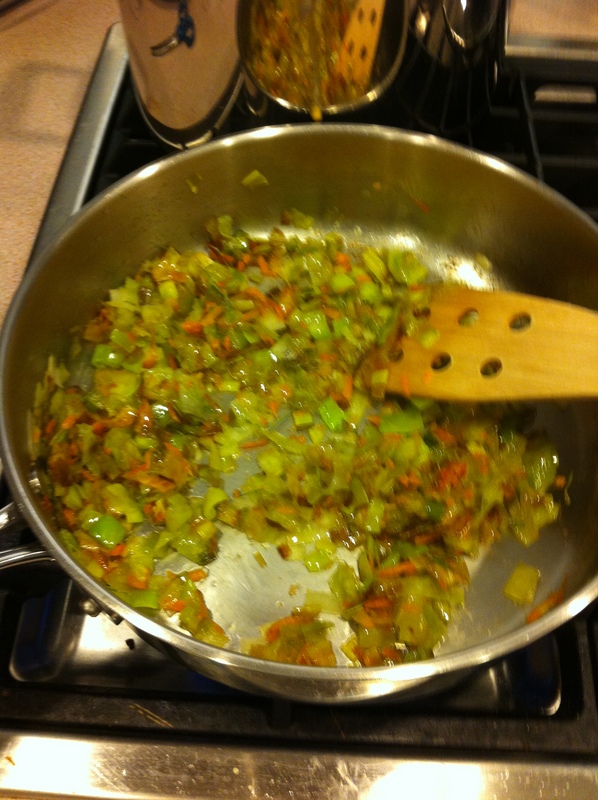 Thinly slice the leek. Add the leek to the butter and oil. Season with salt and pepper. Keep this cooking while you work on the spaetzle. Our goal is soft, buttery, carmelized leeks. 3. 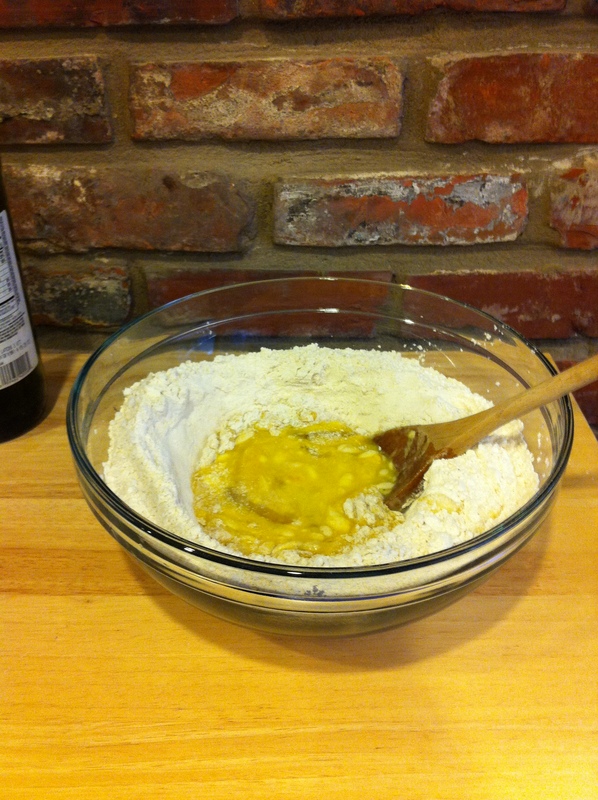 Combine the flour, salt, and sage in a large bowl. 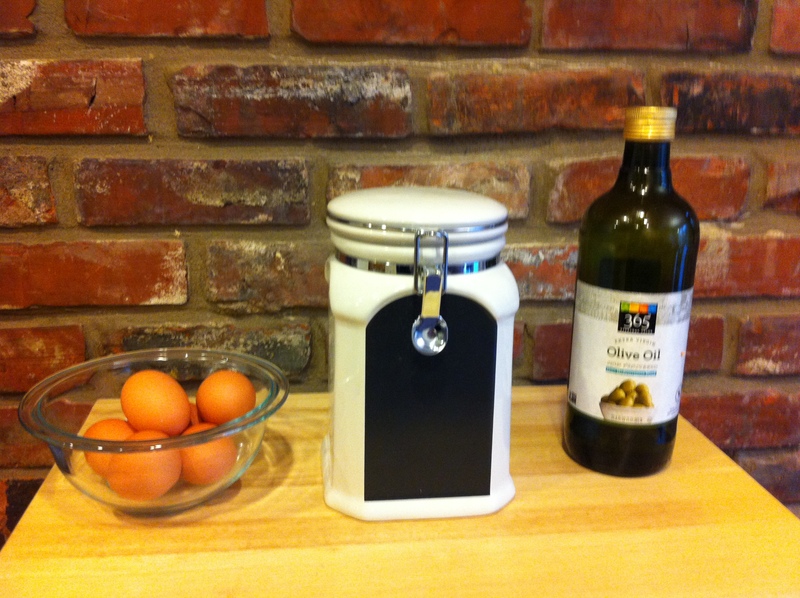 In a small bowl, beat the eggs and oil together. Add it to the flour until it is mostly combined. Slowly add water half cup by half cup and stir constantly. 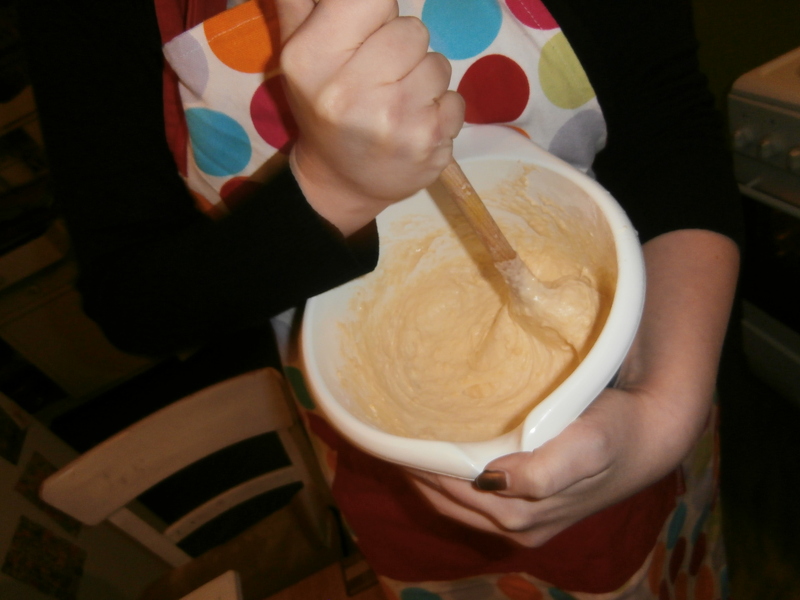 The dough is ready when the dough can slowly drip off your wooden spoon (see photos above). 4. Place spaetzle maker on your pot of simmering water. Have a colander ready sitting in a bowl of cold water to “scare” the spaetzle. Have another bowl ready to receive the “scared” spaetzle. 5. Add the rosemary to the leek mixture and stir. 6. Load the hopper of the spaetzle maker with dough and start pushing it through. If it won’t go through easy enough, add more water to the rest of the dough. 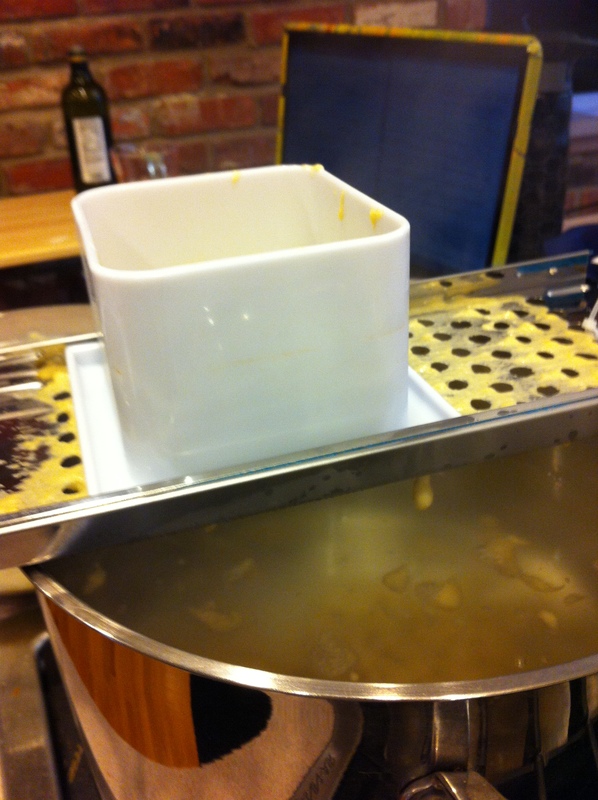 Once the hopper is empty, remove the spaetzle maker and check if your spaetzle have floated to the top (mine were already floating by the time I got one hopper-full into the water. 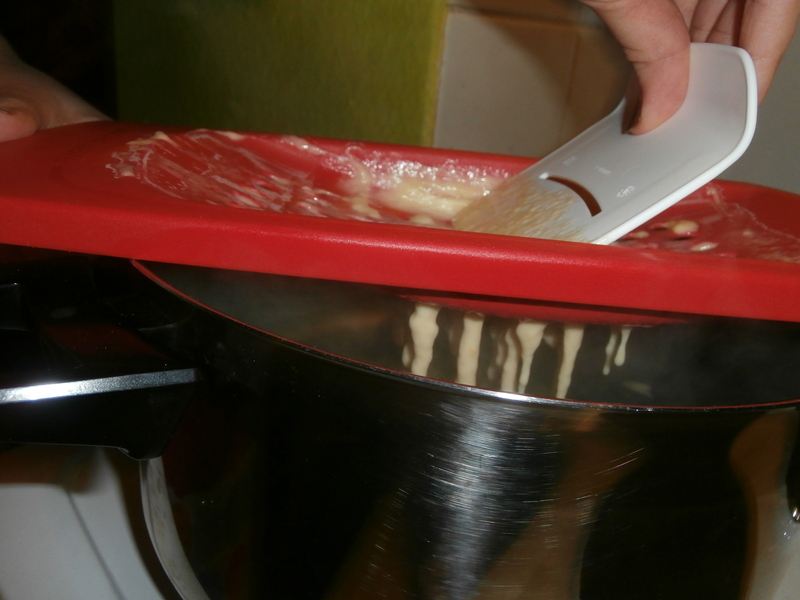 Use a slotted spoon to remove the spaetzle into the cold water. 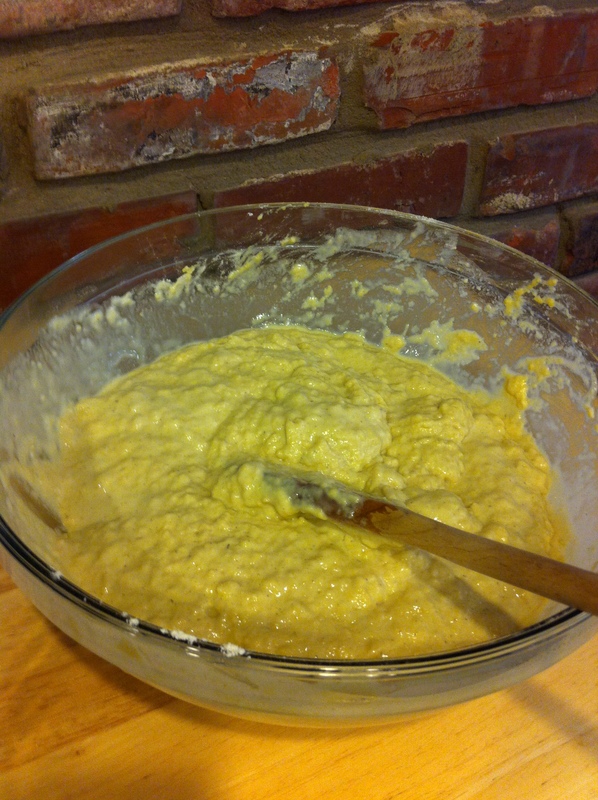 Repeat the process until all of the dough has been cooked, scared, and put into the separate bowl. 7. Spray a 9×13 glass baking dish with nonstick spray. 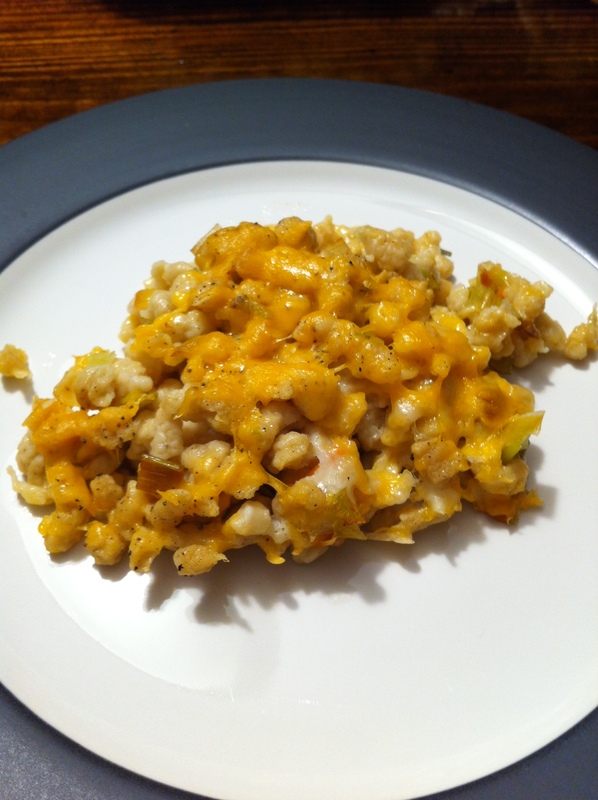 Mix the leeks and 2 cups of cheese into the spaetzle. Dump into the glass pan and top with the remaining cup of cheese. Season with salt and pepper. Bake in the oven until the cheese is melted, about 25 minutes. 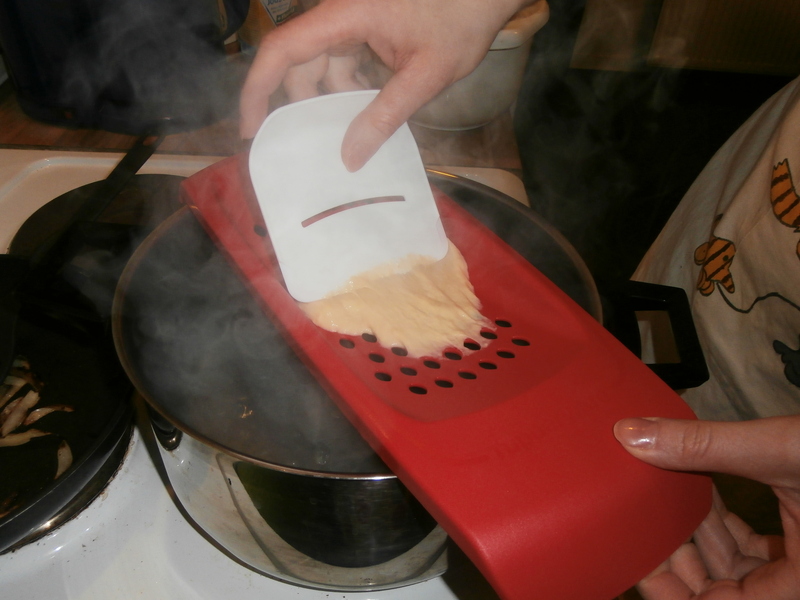 If you are interested in making this, you’ll need to pick up a spaetzle maker. Bed Bath and Beyond sell a spaetzle maker for $7, but the one near me didn’t carry it in store. They will ship it to you directly for free if you order it from the store. Previous Post Previous post: Can cooking make a comeback?